Where should I put this book in my classroom library -- on the shelf with the dog books, or in the tub with the collections of short stories? Actually, it might be fun to create a display with this book and the books of the nine authors who contributed stories to the book! Wouldn't it be fun to compare Jon Muth's Zen picture books with his story of the sculptor Brancusi and one of his white dogs? 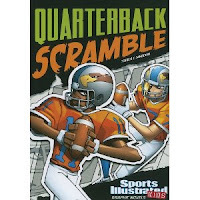 If I gathered multiple copies of this book from the library, the whole class could read the book jigsaw style -- one story per group -- and then have cross-group discussions, and finally a whole class discussion. It would be interesting to see how many kids would go back to read stories from other groups, based on the discussions. As you can see, this is a book with lots of potential! 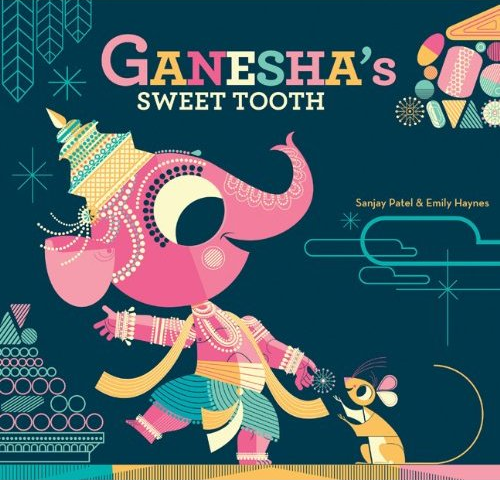 I was pleasantly surprised to find a copy of Ganesha's Sweet Tooth by Sanjay Patel and Emily Haynes from Chronicle Books last week. I had not heard of the book but was immediately drawn to the colorful and happy cover art. 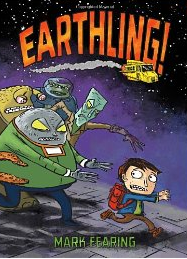 I read the letter from the publisher and learned a bit about the illustrator, Sanjay Patel. Sanjay is an Indian-American animator at Pixar Animation Studios. The letter says that "Sanjay is passionate about using modern graphics to illuminate the ancient stories of his culture." I was intrigued so I went on to read the book. This is a fun story derived from an popular legend in Hindu. This story is about an elephant-headed animal who rides around on a mouse (who is also his best friend). He loves candy and sweets, especially the traditional laddoo. But he accidentally breaks his tusk when he tries a "super jumbo jawbreaker laddoo". He is not upset for long because Vyasa asks him to write an important story and his broken tusk becomes quite handy. From reading the Author's Note, I learned that this isn't actually a retelling of the Hindu legend. Rather it is a bit different--the plot and scenes and details are different. But there is enough of a connection to lead readers back to the original story. This author/illustrator team did an amazing job creating this book together. I am always looking for stories from various cultures and I love this one. There are very few Hindu stories available for children and I am glad to have this one. I think the illustrations are really what makes this book stand out for me . Although it is an ancient tale, the illustrations will grab young readers today-they are colorful, engaging and smart. The illustrations invite today's readers into this story from the past--I think that is so critical if we want to hold onto important stories. Again, I am thrilled to have received this book and am excited to know more about this ancient Hindu legend as well as this illustrator! "There's an article in that!" My laptop's brain is on the brink of being so full it explodes. I won't be able to download the pictures that are on my camera and make my monthly mosaic until I get a new hard drive with about a hundred spare acres so my creativity can once again roam freely. Until then, I'm catching up on my reading, doodling with my colored pencils in my sketchbook, and taking mini field trips to the front and back gardens to visit the two plants I bought at the Clintonville Farmers' Market yesterday -- a female Jack-in-the-Pulpit that is "with seeds," and a Butterfly Milkweed that is purported to be "crack cocaine for butterflies." of me as I am of them? hickory falls in the storm. three hawks! Three means one survived! Next day I see four! 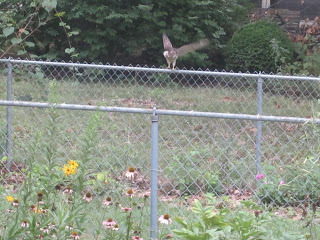 hawks in your neighborhood trees? 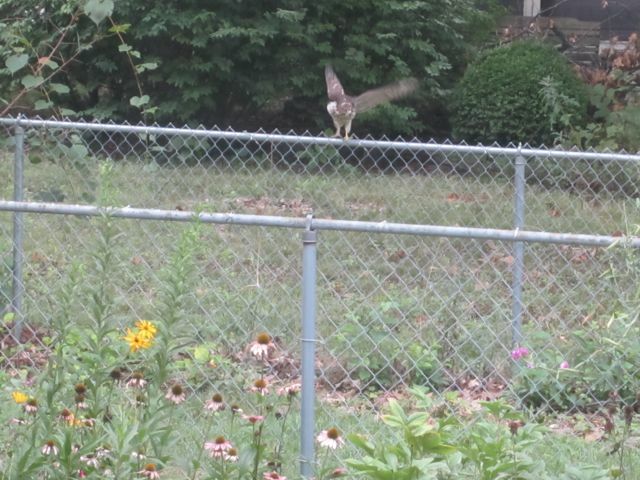 The Coopers Hawks in this story have been a source of fascination and wonder since last spring, when they courted noisily in the sky above our neighborhood, and then began building their nest in our neighbor's tree. They broke twigs from our oak tree for that nest. Late last June, as we drove home through the lashing winds and torrential rains of a severe thunderstorm, my thoughts were focused on our oak. "Please spare our oak, please spare our oak," was my mantra. At the end of our street, we saw flashing red lights. When we got closer, I breathed a sigh of relief -- it was not our oak -- then gasped. 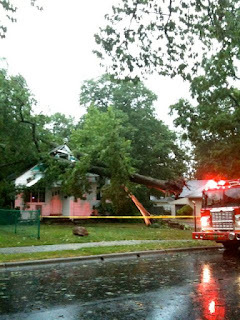 It was not our oak; it was our neighbor's huge hickory, torn out of the ground and split lengthwise. Two homes were destroyed -- our neighbor's house, and the hawks' nest. I have pages of notes and several drafts of poems about the hawks, but I wanted to try to tell the whole story in one poem. I was inspired by Violet Nesdoly's extended haiku about the storm, and wanted to try that form. Violet explains, "I call this an extended haiku but perhaps it isn’t one by an official definition (which I couldn’t find). Anyway, what’s happening here is that each word in the original haiku becomes the beginning word in successive haiku. It’s a fun challenge." At the Choice Literacy writer's retreat this week, we had a minilesson on using a B-C-B-A narrative structure in our article writing. (A = near future, B = present, C = past.) When I looked back at my first draft of this poem, I realized that I had intuitively used at least a version of this structure, shifting back and forth in time. I added the four Acts to help the reader transition between the different "chapters" of the story. One of the hardest things about this form is that first haiku. You need rich words with which to start each of the successive haikus, and which allow you to tell your story. As with all writing, the last hard thing is a strong ending. I struggled with the ending, but Violet was gracious enough to read my draft and give me some writerly nudges. Thank you, Violet! 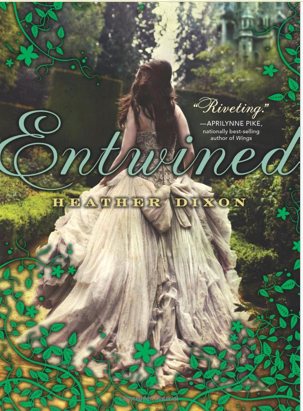 Bibliophile has the roundup this week at Life is Better With Books. 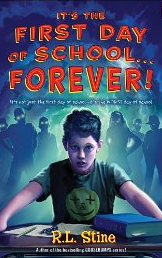 It's the First Day of Schol...FOREVER! I haven't started having my "back to school" nightmares yet, but it's only a matter of time, so I figured it wouldn't hurt to find out what kind of nightmarish first day R.L. Stine would create. It's a doozie. Fall out of bed, wardrobe problems, bad hair, crazy little brother, bullies (including the principal), scorpions, boiler rooms in the basement of the school...and then on page 79, it starts all over again -- same basic story with a few minor revisions because there are some things that Artie just doesn't want to repeat. And then on page 148 it starts all over again, and this is getting too weird. And THEN, on page 158 is starts all over AGAIN!!! R.L. Stine saves the punchline explanation for the very last chapter of the book...and it's a good one. I can't wait to book talk this book! Kids are going to love it!! 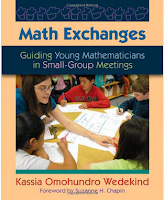 I also read Math Exchanges: Guiding Young Mathematicians in Small Group Meetings by Kassia Omohundro Wedekind and published by Stenhouse. I'm not getting as much professional reading in as I had hoped but I am really committed to reading the math stuff on my list. NUMBER TALKS was an amazing read earlier this summer and I took MATH EXCHANGES with me on my flights this week. I had read bits and pieces of this one when it was released and I had the chance to talk to Kassia for a Choice Literacy podcast. But this time, I read it cover to cover, knowing that I will be teaching math this year. It is a funny thing--people know me as a literacy teacher but I am really a math person--math is far easier for me as a "subject". I think in numbers and logic. I love problem solving And I love to teach math. One of the reasons I love a self-contained classroom is because of the conversations that are similar across subject areas. I've been lucky in my career to teach with a few brilliant math teachers who taught me early on how to make math meaningful for kids. So, I am excited to get back to math teaching and excited to read the newest thinking out there as I plan my year with a new group of 4th graders. MATH EXCHANGES is written about young children. The examples are from K-3 classrooms and the focus is really on very young (K-1) children. But the implications for all teachers is huge. Kassia's understanding of not only mathematics, but of how children develop, how she looks at student work, the strategic ways in which she builds problems and scaffolds for children, taught me a great deal. One thing I love about Kassia's message is her message of "joyful rigor". She says, "Community, rigor, and joy are at the heart of the workshop approach to teaching and learning." She connects much of her workshop to what she has learned from Peter Johnston in Choice Words as she talks about the importance of identity and agency in mathematics. Kassia is honest in admitting that math workshop is hard work. She says, "Math workshop is not the easiest path to take. We have plenty of outside resources willing to tell us exactly what, when and how to teach our students. And yet, none of these resources has the intimate knowledge of our community of mathematicians that you have. Math workshop communities create empowered learners-both students and teachers-who question, wonder, explore and make conjectures. Rigorous joy in math is within the realm of the possible-it is, in fact, what makes math workshop worth it!" Kassia shares her knowledge about math, types of problems, intentional planning and how she learns about a child's understanding. Kassia includes story after story to help us see what this looks and sounds like in a real classroom. The student samples help us begin to see the ways that she learns from student work. 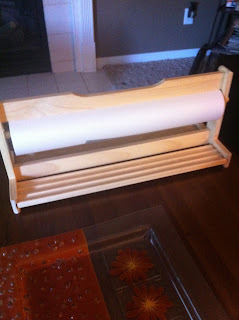 And she includes tools and forms that will help us as we try to implement some of her ideas. We will work to become experts on the development of each of our young mathematicians. I cannot possibly include all that I loved about this book. I cannot possibly share all that I learned or all that I came away thinking with. What I do know is that this book will impact my teaching of math to better match what I believe about students and learning. 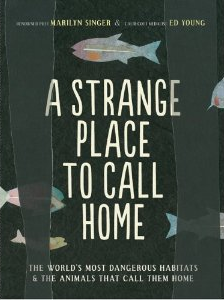 I received a review copy of A Strange Place to Call Home: The World's Most Dangerous Habitats & the Animals That Call Them Home by Marilyn Singer and illustrated by Ed Young. I didn't know about this book before receiving a copy and I was so excited when I opened the envelope. I am always on the lookout for good nonfiction poetry. This is a poetry book about the animals that live in the world's most dangerous habitats. Each poem focuses on one animal--most that I didn't know of--and gives just enough info to build interest. At the back of the book, there is a longer paragraph with more info about the animals. I was most fascinated by Tube Worms, Mudskippers, and Petroleum Flies. Another added bonus is that Singer talks to readers a bit at the end about the poetry forms she used for each of the poems. A book with lots of invitations to delve deeper for readers--my favorite kind of book! This book is due out on August 22 and I think it is one worth pre-ordering right now so you don't forget about it! I have so loved the Now and Then Biographies by Gene Barretta. 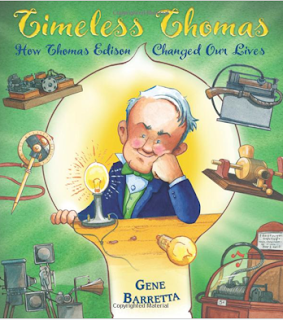 I was thrilled to see the newest in this series because it is about Thomas Edison. 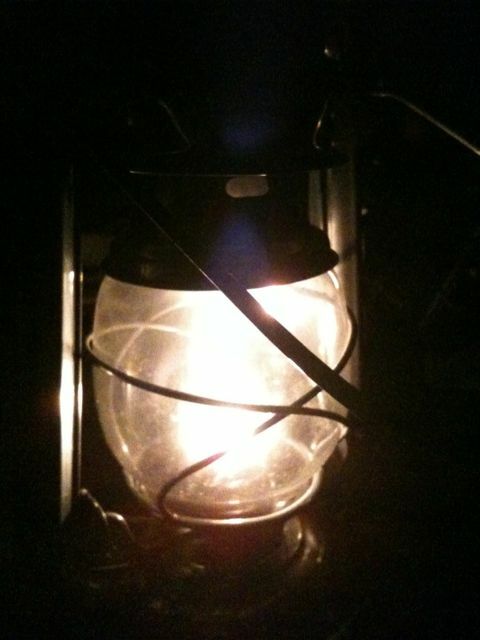 It is called Timeless Thomas: How Thomas Edison Changed Our Lives . Thomas Edison is a big part of Ohio history and his impact on the world is truly incredible. So happy to have this book to add to my collection of picture book biographies! If you do not know the THEN and NOW books by Gene Barretta, they are quite brilliant. Barretta takes things that each inventor invented and shows us how we use that invention now--so we start with something we are familiar with it. Then he takes us back (on the opposite side of the two-page spread) to the original invention. Connecting the two help readers to see how long-lasting the impact the invention is. It also helps to see the evolution and the way that the new idea/technology changed things. The other books in this series are Now & Ben: The Modern Inventions of Benjamin Franklin and Neo Leo: The Ageless Ideas of Leonardo da Vinci . Timeless Thomas might be my favorite of the three. Maybe it's because I love to read about Thomas Edison. A few old movies, one starring Mickey Rooney,Young Tom Edison and another, Edison the Man are two movies that got me interested in the work of Thomas Edison. I don't know how accurate they are but they did let viewers get some insights into Edison's work, life, thinking processes, etc. Every time I read or learn about Edison, I am shocked at the number of inventions that have impacted our lives. Timeless Thomas helps readers understand that. This seems the perfect book for elementary age children. 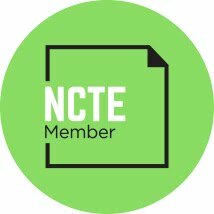 First of all, the "Present Day" pages help readers connect to original inventions by seeing how these things are used today. The book starts out with Edison's invention of the phonograph but because it starts out with "Present Day", it grabs the reader by saying, "We can now record any sound we like and save it. That was not possible before Edison." The next page explains the origin and the workings of the phonograph. The present day piece is very timely and the illustrations and examples are very child-friendly. I also like the book as a writing teacher. 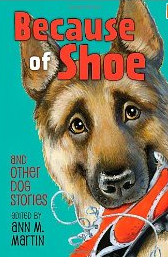 Because there are three in the series, these make great mentor texts for nonfiction. This is one format young writers can study and possibly try on their own. And, I love this book for social studies. Not only does it tie into history (and especially Ohio history) but history of the world/nation and how inventions change things. How communities change because of evolving technology. No poem this week. Sorry. I've got other issues on my mind. Please read this post as a PSA, not a rant or a finger-pointing accusation. Could you please answer a question for me? 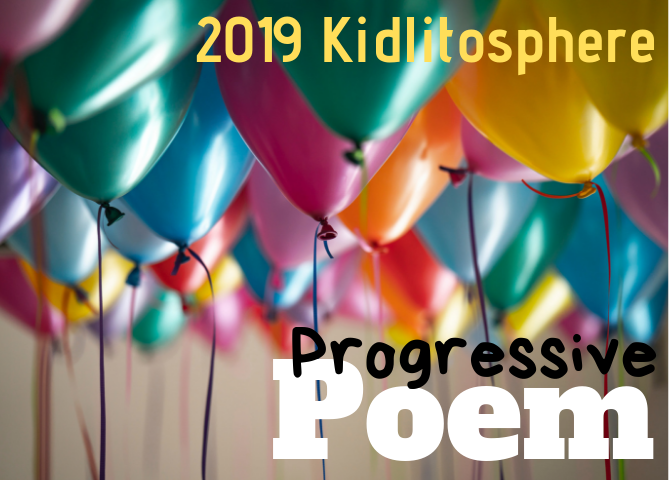 Suppose you wanted to post a poem on your blog that was written by say, Philip Larkin or Elizabeth Bishop (or any famous poet not in the public domain). Could you do so without securing permission and paying for rights? I see such poems all over the internet, and I always wonder if the poet's permission to post was secured. The short answer to that question is that no, a person should never publish a poem on one's own blog/site that's not in the public domain unless permission has been secured (and is included in the post). The true answer is the one you've discovered for yourself -- people do it all the time. The grey space between the short answer and the true answer is the digital citizenship that many Poetry Friday bloggers try to teach by example. If we can't get permission for the poem, we post part of it and link to the site where we found it. Or we link to the book it is from, so that our reproduction of the poem is a form of advertising for the author. The same is true for the images we use on our blog. I mostly use my own photos, but when either of us use a picture that's not our own, we take it from Flickr Creative Commons and cite attribution. We do use book cover images without asking for permission, but always in the context of a positive review of the book and a link for purchase as our form of attribution. Thank you for your question. It pulled my mission as a teacher into sharper focus than ever: it is so essential, so necessary, so mandatory that at school, children are given the opportunity to live the creative life -- reading, writing, making stuff (actual and digital) and sharing their own creations. If they never live on the creative side (even just playing at it, practicing it at school), they will never understand the importance of securing permissions. Because they will fail to see why it matters until they have THEIR stuff out there and they want others not to steal/misuse THEIR creation. "When in doubt, don’t copy and paste. Link to the original content on the site where it was originally published." Thank you for your patience with this departure from the usual light fare of Poetry Friday. Go check out the other offerings on the Poetry Friday Roundup at A Teaching Life. 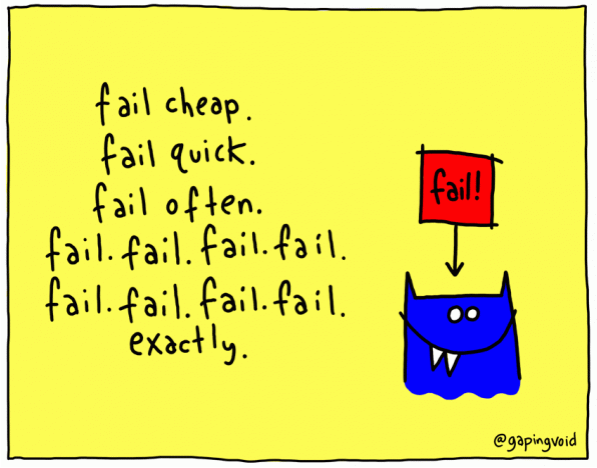 Last week for Cyber PD, in response to chapters 1-3 of Peter H. Johnston's book, Opening Minds: Using Language to Change Lives , I offered a graphic and a single word as my response. JOHNSTON, Page 69: "The problem with apprenticing children into humanity -- the intellectual and social life of society -- is that much of the action we want them to understand takes place inside people's heads. We have to help them learn to imagine what goes on inside heads, and not just the cognitive strategies being used to solve problems, but the complex social-emotional logic that lies behind their behavior." Page 70: "...students who are not very good at reading faces will cause more disruptions in class because of their social behavior." Page 80: "Developing social imagination is a big deal and should be a curricular goal." Nora gets her feelings hurt because a boy in her Kindergarten class tells her, "You have flamingo legs!" 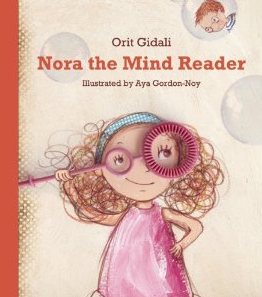 But Nora's mom gives her a magic wand that allows her to "see what people were saying as well as what they were really thinking." Even though Nora comes to realize that the other children don't always intend for what they say to be hurtful, it's best just to say what you really mean. When Nora's dog gets ahold of the magic wand, the moral of the story is translated into Wag More, Bark Less. Jill Fisch has the roundup for today's Cyber PD posts at My Primary Passion. So, what does it take to be picked for the first read aloud of the year? It needs to have a strong hook for all listeners. 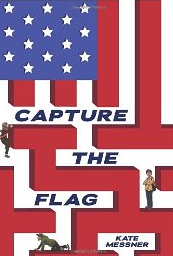 Not only does Capture the Flag have a strong first chapter with an incredible cliffhanger (way to leave a thief in the chamber with the Star Spangled Banner, Kate!) it has a punchy lead with short sentences and carefully placed details that will become important later in the story. This is a beginning chapter to return to for craft study in writing workshop. It needs to have good characters for all listeners. Anna wants to be a reporter, like her mom. She's got the burning curiosity and the bulldog tenacity that will become important. Henry's got his video games. Kids are going to love it that what he's learned from playing video games will help the characters at almost every turn in the story. José has a backpack full of Harry Potter and a quote for every occasion. What José has learned from reading, along with the books themselves, will be crucial to the story. There is also a dog, an 8 year-old from Pakistan who collects and sketches idioms, and a secret society who protects famous art in the world. So there's at least one character for everyone in this book. It needs to be fairly fast-paced and adventure-filled. Three kids trapped by a snowstorm in an airport with a mystery to solve, chase scenes in the baggage holding area, evil guys with snake tattoos. Yeah, Capture the Flag has plenty of action. It needs to have potential for big discussions beyond the book. I can imagine that my very international mix of students will have passionate discussions about immigration laws, cultural stereotypes, and discrimination. I'm thinking we'll research where the presidential candidates stand on immigration policies -- a topic that matters to many of my students and their families. I'm not finished with my summer reading, so another book might make it to the top of the "first read aloud" pile before the end of August, but right now, it's looking good for Capture the Flag. 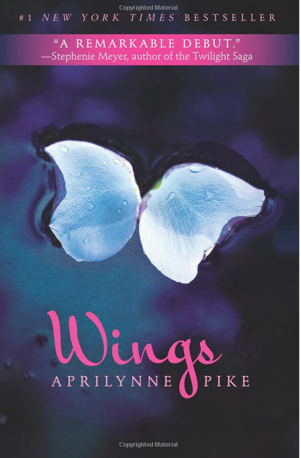 This book was written by Aprilynne Pike. I just read the book about 3 weeks ago. The book is about a girl named Laurel and how she starts to feel different. Then one day she looks in the mirror and sees she has wings on her back. While she tries to figure out what’s going on, she then meets two guys. One of the guys is named David and he is human but the other is named Tamani. Tamani is like Laurel, he’s not human. Throughout the story David and Tamani are fighting to get Laurel’s attention. Meanwhile, Laurel finds out that things are not what she thought they were. Things start to happen and Laurel realizes that she doesn't like to feel weak. She figures that out very soon in the book. She is also very stubborn. Soon, bad magical creatures start to show up in the human world. What will happen when her stubbornness gets her into trouble and danger? Right now I’m reading Halo. I’m only about halfway done with the book but so far it’s great. The main character in the book is a girl named Bethany. She has an older brother, Gabriel, and sister named Ivy. Beth and her sister and brother are not normal. They are angels sent from heaven to protect the people on earth. While Beth is on earth she meets a guy named Xavier who she starts to have feeling towards. 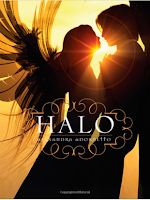 I like the book because the whole part of them being angels is really cool to me. The way Beth acts as a human is funny. Her brothers and sister have been to earth before but she never has so being in human form is all new to her. I hope to finish the book soon. Elisa is 16 years old and a princess and so is her sister Alodia. Alodia is the heir to the thrown. Elisa is not the prettiest or skinniest of girls but there is something remarkable about her. She is the bearer of the god stone. There is only one person who bears the god stone once every century and she was chosen. Elisa is about to get married to a man she has never met. This man is named Alejandro and he is king of Joya. They are hoping that if Elisa is the queen that the city will go back to how it was in the beginning and the kingdom will come out of there hard times. Though that is not what happens. 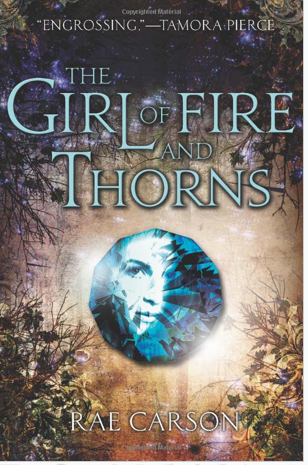 Elisa is taken to a city where their people are in a bad time. Along the way she falls in love and they have to run away from people that are trying to get Elisa for her god stone. This is a great story about love, adventure and finding out who you really are. What if in one second your life could change forever? What would you do if there no longer were any adults? If you were trapped from the outer world by a wall that surrounded you? How would you cope when the once safe world ruled by adults was now ruled by bullies? That’s what happens to Sam and the kids that live in Puerdo Beach, CA. 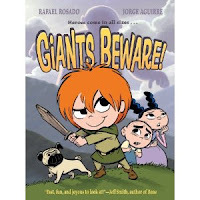 Sam, his friend Quin and a really smart girl named Astrid from his school try to set things right while the adults are gone. Along the way the three of them meet some friends and make some enemies. Throughout the story you get to see the story from a bunch of characters' points of views and see how they deal with their new life. Michael Grant did a great job at putting a bunch of twists and turns in the story and describing everything that happens well. There is violence, sadness, love, mystery, and creepy things that go on in the book. It’s kind of like The Hunger Games when they get thrown into the arena but more violence in a way. Within the first chapter I was hooked and had to keep reading so I could find out what happened to the characters. 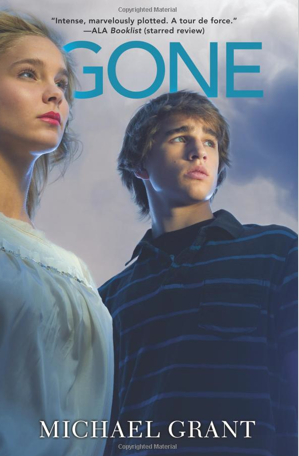 The GONE series is one of my favorite books and is an intriguing series. 16 year old Beatrice has come to a point in her life where she has to make a choice that will change her life forever. In the world Beatrice lives in, the people are divided by factions. The factions are Candor: the honest, Abnegation: the selfless, Dauntless: the brave, Amity: the peaceful, and Erudite: the intelligent. Beatrice and her brother Caleb were born in the faction Abnegation. Now they both have to choose if they want to stay in Abnegation or join another faction. One of the hard things about being in a faction is that once you chose there is no going back and you are only allowed to socialize with people in your faction. Beatrice ends up choosing to join the faction Dauntless. 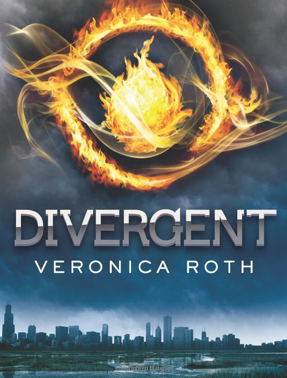 Before she can be Dauntless, she has to go though a camp were she learns what you need to know to become Dauntless. The camp is not easy though. People who get eliminated from the camp become faction-less. If you like stories about the Twelve Dancing Princesses, then you will like this book. Azalea is the oldest of all her sisters. During the story, the twelve sisters lose their mother and they have to go into a time of grieving. During this time they are not allowed to do any thing that is remotely happy like dancing. All the sisters want to find a way to escape the grieving in the castle, so they find a mysterious place. But, when the sisters meet a mysterious and dashing man named Keeper that lives in the mysterious place things start to change. Azalea also meets a handsome young man during the story who happens to take a liking to Azalea. Will anyone be able to find out where the Twelve Dancing sisters go at night and why their shoes are always torn up and beaten the next morning? During the story you see how one thing lead to another and how things get entwined with each other. Thanks to Jen and Kellee for hosting this great weekly event at TEACH MENTOR TEXTS! This fundraiser is simple. You give $3 to RIF at the Macy’s register, and you get a coupon for $10 off your purchase of $50 or more. With only 1 book for every 300 kids in need in the United States, the support from Macy’s and customers like you makes a real difference in our ability to get books to kids who need them most. And this campaign is a win-win. You save and you help RIF get books to kids. There’s also even more saving to be done with Macy’s One Day Sale happening this weekend in stores nationwide. Even if a Macy’s store isn’t in your area, you can still get involved through our online sweepstakes. You’ll have a chance to win a $500 Macy’s gift card and help us spread the word about the campaign. This year, I bought several things that I am excited about. These things will help me create purposeful spaces for kids. I have used these tables in classrooms and libraries before. I like them because they are so flexible. 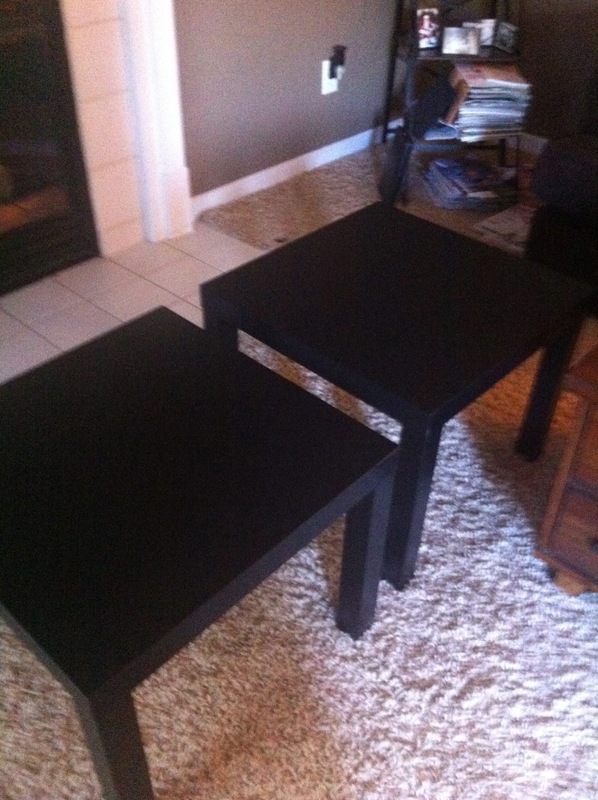 Kids can push them together to create a larger table. They can move one to a spot if they need a quiet space to work. They stack so storage is easy. I am not sure about these but for $3.99, I thought I'd give them a try. 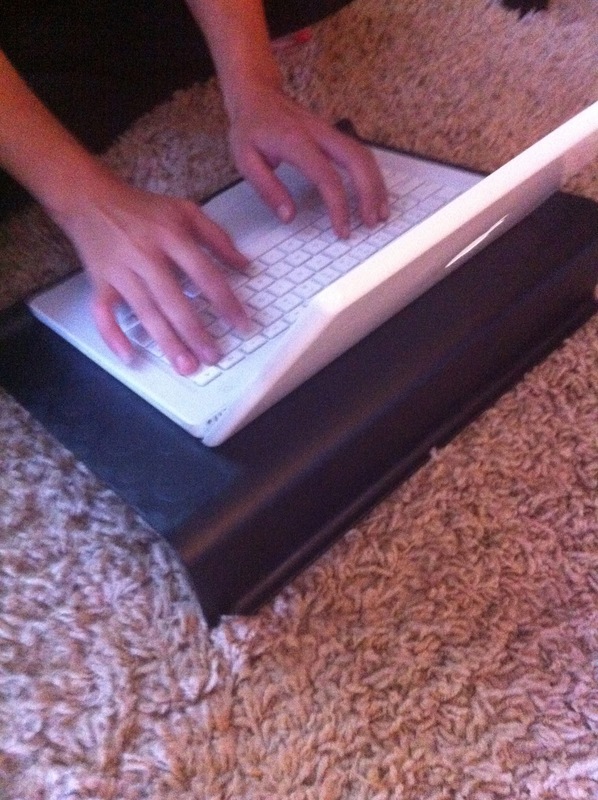 Laptops on the floor make me very nervous. So I don't usually allow kids to use them on the floor. I envision one being stepped on. 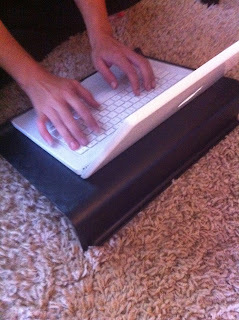 These plastic laptop supports seem like a good support for kids who work on laps or floors. I am not sold on them but thought they were worth a try. This is a fun little thing I am excited about. It is a paper roll holder with lots of big paper. I work a lot with my kids about tools for thinking and this seems to invite creation and problem solving. I am hoping it is used when a group of kids is working something out and needs a big piece of paper to make sense of their thinking in a collaborative way. I think it has huge possibilities and by having it visible in the classroom, it gives another option. Choosing the right tool for the purpose is so important and the more tools we have, the better problem solvers I think we become. I am lucky enough to have tables for seating this year. I prefer tables when possible. But I also want a few spaces where kids can go off and work on their own or with one partner. I like pieces that can be pushed against the wall to create a less distracting spot for thinking and learning. 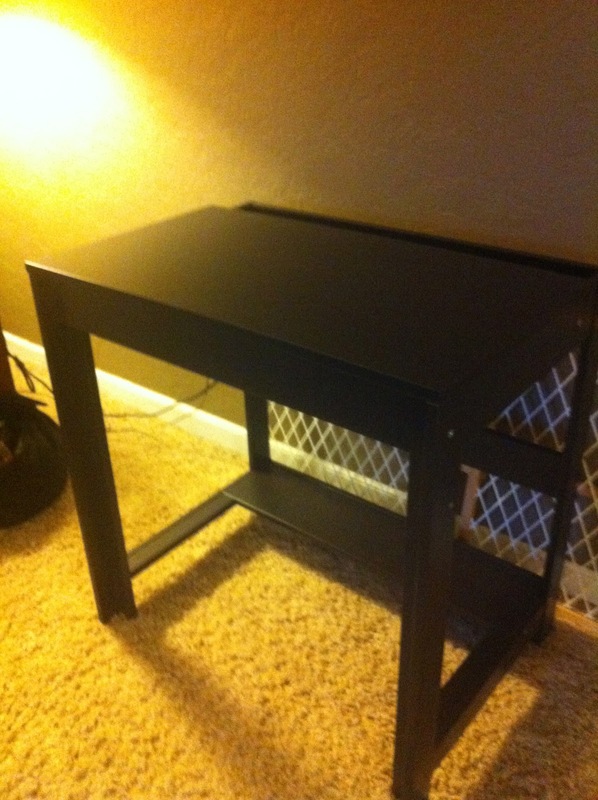 So this desk will serve that purpose. Lots of options for where it can go and that is important. I like pieces with lots of flexibility. These stools were popular in the library last year and I've had them in my classrooms before. I love how light and sturdy they are. I love that they stack for easy storage. 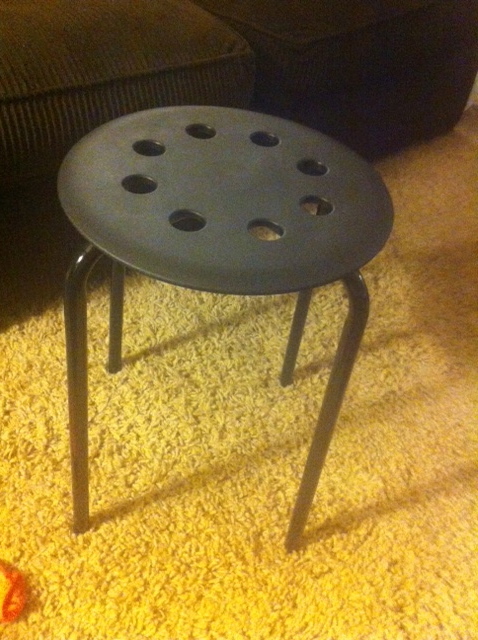 I love the flexibility they provide--kids can take the stools when one more chair is needed at a table, they can create their own circle space with a few tools, etc. They add so many possibilities for collaboration because they are so portable. I also purchased a few storage containers. I don't have things to keep building toys, games, math manipulatives and other materials in. The storage in my new classroom is at the top of the room--above where children can reach. Since I want things to be accessible to the students at all times, I found some plastic tubs that will make that possible. Looking forward to bringing these new things to the classroom! I ain't a'feered of snakes ner spiders, and ticks don't make me twitch. I kin roll around nekked in a poison ivy patch and never even itch. I ain't skeered much of lions ner tigers, or other carnivores much bigger. 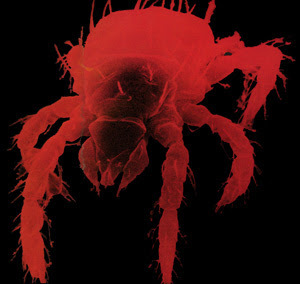 The only critter that gives me the chills ... is the cold-hearted chigger. They ain't no bigger than a dot. Most folks have never seen one. You don't even know they bit ya', till they've already et' and gone. And drilled yer skin with a bitin' end that's part needle and part digger. Pound fer pound, the baddest bug around ... has got to be the chigger. I hacked down a monstrous pile of weeds in our school's land lab on Wednesday. For my trouble, I got a single chigger bite on the back of my right leg, right at the top edge of my sock. What's the big deal with a single chigger bite, you ask? Well, if you have to ask, you've never had any. If you have had chiggers, you know I'm going nearly mad with the itching. Thank goodness I only got one. Pass the calamine lotion, please. constitute my response to chapters 1-3 of Peter Johnston's Opening Minds: Using Language to Change Lives , in the Cyber PD event sponsored by Cathy, Jill, and Laura. Check the other posts that Cathy has rounded up at Reflect & Refine: Building a Learning Community for more eloquent responses (and to figure out what this post might mean). Because they're not always easy, and they're not always fluff. 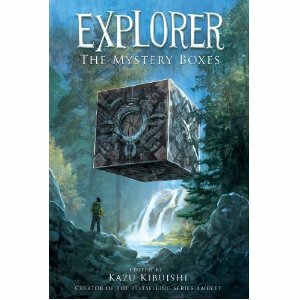 The seven stories in this book all answer the question, "What's in the box?" but they all do it VERY differently. 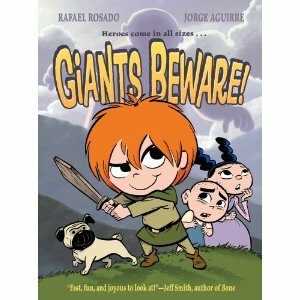 Graphic Novel readers will enjoy finding the art and story telling of favorite authors Kazu Kibuishi (AMULET) and Raina Telgemeier (SMILE), and discovering the new styles of other graphic novelists. Because there are text structures like a prologue and an epilogue, a newspaper, a map, a song, journal entries and diagrams in a story that features a SEED as the protagonist!! So we can talk about stereotyping, and stated vs. implied themes, and how books are marketed. Because they are not always quick reads. Sometimes they are 245 pages and 9 chapters long. They make us think again about our Earth-centric view of the universe. They give the terror of missing your bus and being the new kid at school a whole new dimension.